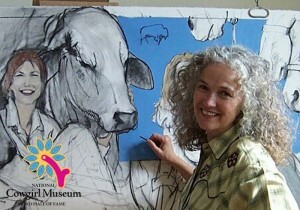 Donna Howell-Sickles has taken the image and idea of the cowgirl beyond charcoal lines and into reality. She has explored the layers beneath the cowgirl’s engaging exterior for more than thirty years. A vintage postcard featuring a cowgirl with ruby red lips atop her horse instilled in Donna a fascination with the cowgirl spirit. The cowgirl was at once both familiar and unreal. This dichotomy is the idea behind Donna’s artwork, and has inspired her to create images of women that are both real and mythical. Donna’s artwork encapsulates the camaraderie and the timelessness of the cowgirl spirit.